I am reading a biography on George Bellows and came upon his involvement in the pivotal Armory Exhibition in New York in 1913. This exhibition would introduce America to all the new trends that were happening in France: Cubisim, Futurism, Post Impressionism and the like. Art in America after the exhibit would never be the same. 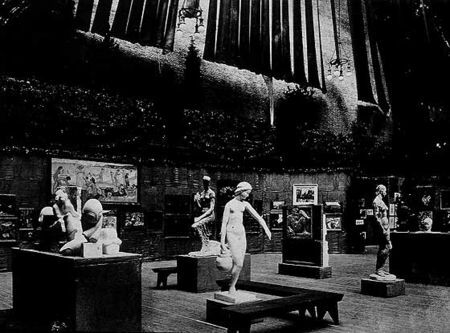 As soon as the show opened to the public the following Monday, the Reception and Publicity Committee sprang into action, requiring Bellows and other to station themselves at a desk near the entrance, greeting visitors, escorting them, if need be, through the exhibition, and attempting to answer any and all questions, no matter how bizarre. This entry was posted in Interesting.... and tagged Armory Exhibition, Arthur B. Davies, Constantin Brancusi, George Bellows, Georges Braque, Marcel Duchamp, Pablo Picasso, Theodore Roosevelt, Tim Timmerman. Bookmark the permalink.